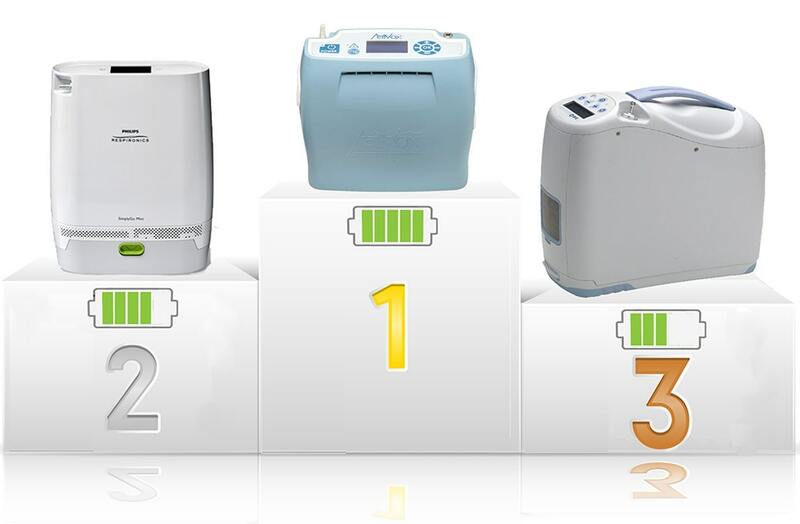 Does your current oxygen concentrator require frequent charging? Tired of limiting your time eating out, shopping, traveling, and visiting family? Sounds like it's time to upgrade to a portable unit with a longer battery life! Ready to see who came out on top? Check out our winners below! The SimplyGo Mini is an innovation in portable technology backed by the reliable Respironics name. Having up to twelve hours of battery life means leaving the worrying behind you! The SimplyGo Mini’s lightweight, sleek design, and attractive custom carry case is ideal for the daily traveler! With 4-12 hours of battery life (depending on the setting) you can now enjoy shopping, trips to the grocery store or social gatherings. Travel is once again unlimited. Only 5 pounds with Standard Battery! Includes: Unit, AC/DC Adapters, Custom Carrying Case, Shoulder Strap, Handle Strap, Accessory Bag, Cannula, and Manual. The ActivOx 4L by Inova Labs is our incredible first place winner! This lightweight powerhouse features an internal battery with up to 10.25 hours of battery life! Couple that with the supplemental battery and you have upwards of 6-13 hours (depending on pulse setting used) for shopping, eating out, taking a stroll, visiting family, and more! Batteries should never get in the way of living your life! Take back the control with the ActivOx 4L! Feather-Light 4.8 pounds with Internal Battery! Includes: Unit, AC/DC Adapters, 4-Way Carry Case, Shoulder Strap, Cannula, and Manual. The Inogen One G2 is an efficient and powerful part of the Inogen family. Weighing in under 10 pounds, this unit can go anywhere you want to go! It also has a convenient backpack for easier travel. Let’s also not forget the G2’s extraordinary decibel level of 38, quieter than a library! With 6 pulse settings and the potential for up to 3-10 hours of battery life, the G2 is a discreet and powerful option for those on the go! Includes: Unit, 12 Cell Battery, AC/DC Power Adapter, Carry Bag, Cannula, and Manual.